Wednesday, March 20/The New Orleans Jazz Museum at the Old U.S. Mint (400 Esplanade Avenue): Friend Of the Cabildo will be screening the 2015 film Big Charity: Death of America’s Oldest Hospital. Screened in the third-floor performance space of The New Orleans Jazz Museum at the Old U.S. Mint, the FOC Film Series highlights the best films and documentaries that showcase New Orleans and Louisiana. For this documentary, former employees of Charity Hospital will be on hand for the discussion following the 7:00 PM showing led by Dr. Vivian Norris. Tickets are on sale now for the film ($15 GA/$10 Members) for both the 5:30 PM and 7:00 PM showings. Tickets can be purchased by calling the FOC Office at (504) 523-3939 or by clicking here. Thursday, March 21/Marigny Opera House (725 St Ferdinand Street): Book of Saints returns to the Marigny Opera House after its debut in 2017. 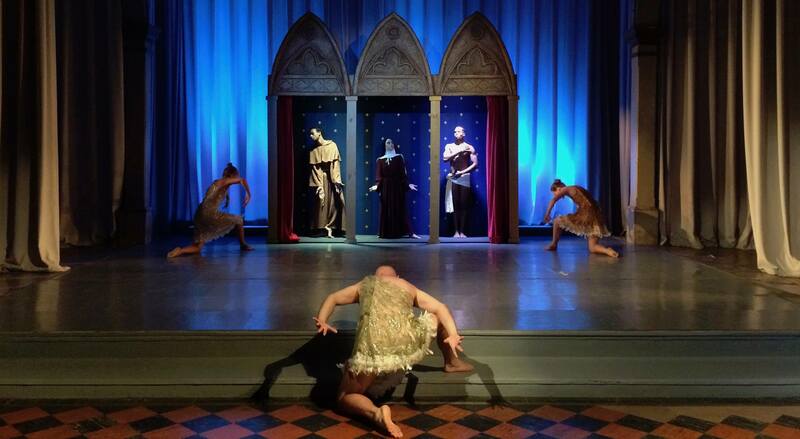 Teresa Fellion’s two-act ballet is an illumination of the lives of three beloved saints: Teresa of Avila, Sebastian Martyr and Francis of Assisi. The original score for orchestra and chorus by New Orleans-based composer Tucker Fuller merited a Gambit award. Accompanied live by the New Resonance Chamber Orchestra and Krewe de Voix Chamber Choir. The show on Thursday begins at 7:00 PM, tickets cost $32.00, and shows run until Sunday, March 24. For more details, you can check out their event page here. Thursday, March 21/The Mexican Cultural Institute (900 Convention Center Boulevard): The Mexican Cultural Institute in collaboration with the New Orleans Hispanic Heritage Foundation is presenting the exhibition “Calladita te ves mas bonita / Be pretty and shut up” by Carmen Mariscal and curated by Marcela Correa from March 21 to May 24, 2019. There will be an opening reception on Thursday, March 21 from 6:00 PM to 9:00 PM. Friday, March 22/The Broad Theater (636 N. Broad): In the Arab-American neighborhood outside of Chicago where journalist and filmmaker Assia Boundaoui grew up, most of her neighbors think they have been under surveillance for over a decade. While investigating their experiences, Assia uncovers tens of thousands of pages of FBI documents that prove her hometown was the subject of one of the largest counter terrorism investigations ever conducted in the U.S. before 9/11, code-named Operation Vulgar Betrayal. With unprecedented access, the film The Feeling of Being Watched weaves the personal and the political as it follows the filmmakers examination of why her community including her own family fell under blanket government surveillance. This documentary, which begins at 9:15 PM, is part of the Patois Film Festival, which will be taking place from March 21-24. For a full rundown of films, you can check out their website here. Saturday, March 23/Arise Academy (3819 St. Claude Avenue): Dance for Social Change is here and Dancing Grounds is having The Block Party to kick off their major #DanceforSocialChange festival events. You can join them for a celebration of young artists in the yard of DG partner school, Arise Academy, featuring 10+ youth performance groups, free dance classes, food, family-friendly activities, a bounce house, and tables highlighting local advocacy efforts. Then event is hosted by Con Sibley and there will be music by DJ Felice Gee. The Block Party begins at 11:00 AM and goes until 3:00 PM. For a full rundown of the events, you can check out their page here.